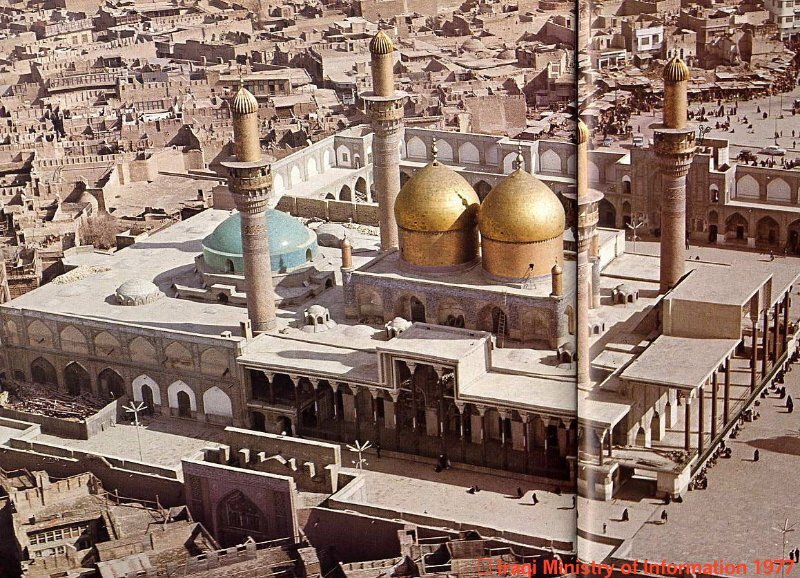 In 799 Imam Musa Ibn Ja'afar Al-Kazim, the seventh imam, died and was buried at the actual spot of the shrine. The shrine then became a pilgrimage site for the Shi'ite community. A town grew around the grave yard. 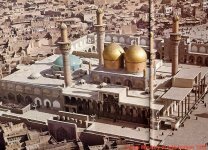 The name of the town became Kazimiya, the town of the Imam Kazim (AS). This status was later reinforced by the subsequent burial in 835 of the ninth Imam, Muhammad ibn Ali al taqi al Jawad, who died in Baghdad. He was buried by the side of his grandfather Imam Musa ibn Ja'far. It is because of the two Imam's who were famous for their suppression of anger that the place was called Kazemain, the two Kazims, the enduring ones. A reputed school of theology was founded in this town which is still a source of learning for many students from all over the world. 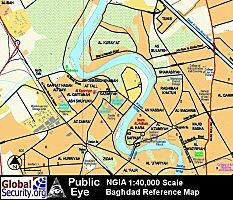 In mid-September 2004, as part of an Army-wide effort to give its facilities around Baghdad friendlier connotations, Camp Banzai was renamed Camp Justice, with its Arabic translation "Camp Al-Adala". In May 2005 the administrative duties of Camp Justice were transferred to Iraqi forces. 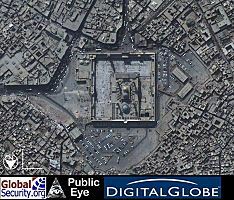 Camp Justice is located in downtown Baghdad, in the Kadhamiyah neighborhood, near the Imam Kadhim Shrine. The Shrine was the site of numerous explosions in early-March 2004. US soldiers initially responded to the scene to treat injured Iraqis but fell back when confronted with a stone-throwing mob of angry Shiites who blamed US forces for providing inadequate security for the targeted religious pilgrimage. As of September 2005, Camp Justice was home to 4,000 Iraqi brigade members and 250 U.S. advisers. Iraqi forces working out of Camp Justice have had many operational successes. They have helped make the once no-go zone, Haifa Street, quieter. They also rescued a kidnaped Australian, Douglas Wood, from his captors in June 2005. Justice is the headquarters of the Public Order Forces (POF) and as of March 2005 it held about 650 prisoners. The POF is a police paramilitary division with a history of torture and abuse and conditions at Justice for prisoners were said to be poor. Detainees often are held at Camp Justice for many months without course for legal appeal because of a lack of judges and the Iraqi police's unwillingness to let many detainees see a judge. Camp Justice was never meant to hold prisoners for long periods of time but conditions on the ground changed and the lawlessness in Baghdad has created many more arrests than originally expected. The four room prison area of the camp is notorious for overcrowding and has had allegations of torture. American military officials have attempted to better the situation at Camp Justice by taking a more active role in the training and observation of Iraqi forces' treatment of prisoners and cases of detainee abuse have reportedly lowered. However, Camp Justice is still an Iraqi facility and the Americans can only watch so much. As of September 2005, the U.S. provided a $350,000 monthly stipend to the Defense Ministry to manage the base. However the Defense Ministry experienced many difficulties in managing the base and funds repeatedly dried up. There have been problems in electrical wiring, ammunition supplies mortar damage repair, sewage system difficulties and poor quality sleeping quarters. For the first time in Iraq's history, Iraqi leadership at an Iraqi base conducted an all-female IA basic training course. For two weeks, 27 female recruits have had intensive training to learn the necessary skills to become a Soldier. 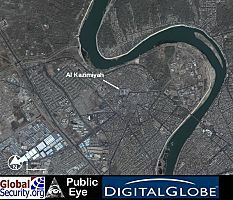 Al Kazimiyah and surrounding area. Al kazimiyah Mosque and surrounding area. sites bombed by terrorists in Iraq. 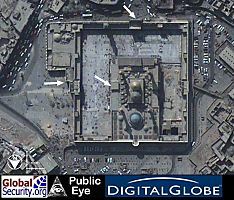 On 2 March 2004, The Al Kazimiyah Mosque was one of the several sites bombed by terrorists in Iraq. Annotation depicts approximate locations of the bombings.